A postcard depicting the broken vaults and stained glass windows of Cathédrale Notre-Dame de Reims, or Our Lady of Reims, during the years in which it was bombarded by the German Army in World War I. Originally the site of the coronation of the French kings, photographs of the destruction of cathedral were used as propaganda images by the French against the Germans. This photographs shows the holes in the cathedral's vaults and stained glass windows that were damaged by the bombardments from the interior of the building. Original 5 x 3 inch black and white photographic postcard: ACC# SM-00-243, file folder 1A (non-U.S. blanks), box 10A, Lucile (Mary Lucile) Campbell Collection, UCF Public History Center, Sanford, Florida. Digital reproduction of original 5 x 3 inch black and white photographic postcard. Originally published by G. Dubois. 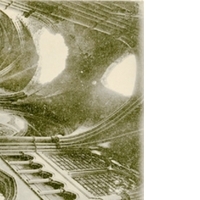 “Reims Cathedral During 1st Bombardment Years Postcard.” RICHES of Central Florida accessed April 26, 2019, https://richesmi.cah.ucf.edu/omeka/items/show/6646.